These examples show how to assess whether a series has volatility clustering by using the Econometric Modeler app. Methods include inspecting correlograms of squared residuals and testing for significant ARCH lags. The data set, stored in Data_EquityIdx.mat, contains a series of daily NASDAQ closing prices from 1990 through 2001. 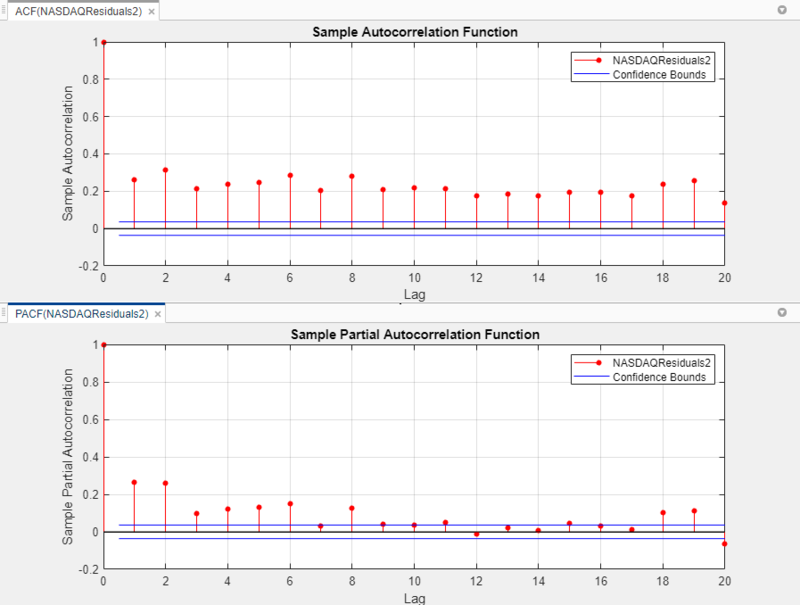 This example shows how to visually determine whether a series has significant ARCH effects by plotting the autocorrelation function (ACF) and partial autocorrelation function (PACF) of a series of squared residuals. At the command line, load the Data_EquityIdx.mat data set. The data set contains a table of NASDAQ and NYSE closing prices, among other variables. For more details about the data set, enter Description at the command line. Convert the table DataTable to a timetable (for details, see Prepare Time Series Data for Econometric Modeler App). The variables appear in the Data Browser, and a time series plot of all the series appears in the Time Series Plot(NASDAQ) figure window. In the Data Browser, select NASDAQ. With NASDAQLog selected, in the Transforms section, click Difference. In the Data Browser, right-click NASDAQLogDiff. 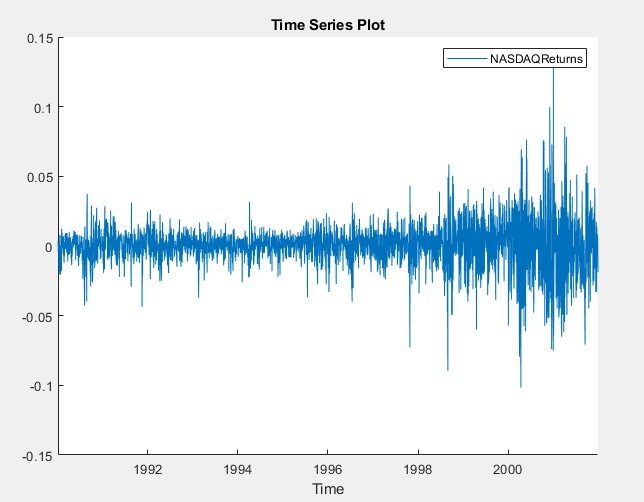 The time series plot of the NASDAQ returns appears in the Time Series Plot(NASDAQReturns) figure window. In the Data Browser, right-click NASDAQReturns. In the context menu, select Export. NASDAQReturns appears in the MATLAB Workspace. For numerical stability, scale the returns by a factor of 100. Create a residual series by removing the mean from the scaled returns series. Because you took the first difference of the NASDAQ prices to create the returns, the first element of the returns is missing. Therefore, to estimate the sample mean of the series, you must use nanmean. Add the squared residuals as a new variable to the DataTable timetable. In the Econometric Modeler dialog box, click OK to clear all variables and documents in the app. In the Import Data dialog box, in the Import? column, select the check box for DataTable. In the Data Browser, select the NASDAQResiduals2 time series. Click the Plots tab, then click ACF. Close the Time Series Plot(NASDAQ) figure window. Then, position the ACF(NASDAQResiduals2) figure window above the PACF(NASDAQResiduals2) figure window. The sample ACF and PACF show significant autocorrelation in the squared residuals. This result indicates that volatility clustering is present. This example shows how to test squared residuals for significant ARCH effects using the Ljung-Box Q-test. Load the Data_EquityIdx.mat data set. 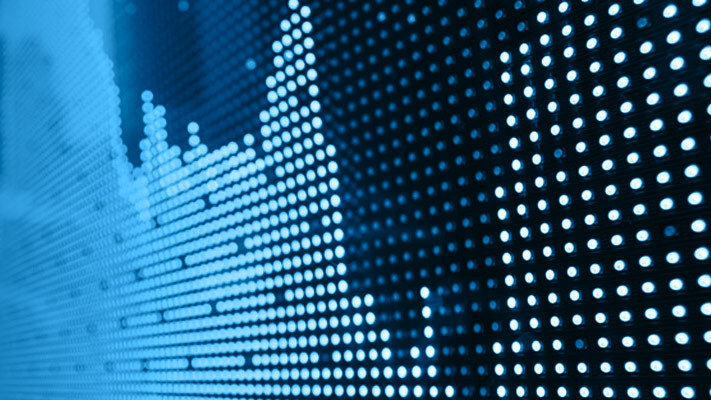 Convert the NASDAQ prices to returns. To maintain the correct time base, prepend the resulting returns with a NaN value. Compute residuals by removing the mean from the scaled returns. Add the vector of squared residuals as a variable to DataTable. Convert DataTable from a table to a timetable. For more details on the steps, see Inspect Correlograms of Squared Residuals for ARCH Effects. Test the null hypothesis that the first m = 5 autocorrelation lags of the squared residuals are jointly zero by using the Ljung-Box Q-test. Then, test the null hypothesis that the first m = 10 autocorrelation lags of the squared residuals are jointly zero. On the Econometric Modeler tab, in the Tests section, click New Test > Ljung-Box Q-Test. On the LBQ tab, in the Parameters section, set both the Number of Lags and DOF to 5. To maintain a significance level of 0.05 for the two tests, set Significance Level to 0.025. Repeat steps 3 and 4, but set both the Number of Lags and DOF to 10 instead. The test results appear in the Results table of the LBQ(NASDAQResiduals2) document. The null hypothesis is rejected for the two tests. The p-value for each test is 0. The results show that not every autocorrelation up to lag 5 (or 10) is zero, indicating volatility clustering in the squared residuals. This example shows how to test residuals for significant ARCH effects using the Engle's ARCH Test. Add the vector of residuals as a variable to DataTable. The variables appear in the Data Browser, and a time series plot of the all the series appears in the Time Series Plot(NASDAQ) figure window. Test the null hypothesis that the NASDAQ residuals series exhibits no ARCH effects by using Engle's ARCH test. Specify that the residuals series is an ARCH(2) model. In the Data Browser, select the NASDAQResiduals time series. On the ARCH tab, in the Parameters section, set Number of Lags to 2. The test results appear in the Results table of the ARCH(NASDAQResiduals) document. The null hypothesis is rejected in favor of the ARCH(2) alternative. The test result indicates significant volatility clustering in the residuals.